Icebergs aren't a common sight in Massachusetts. 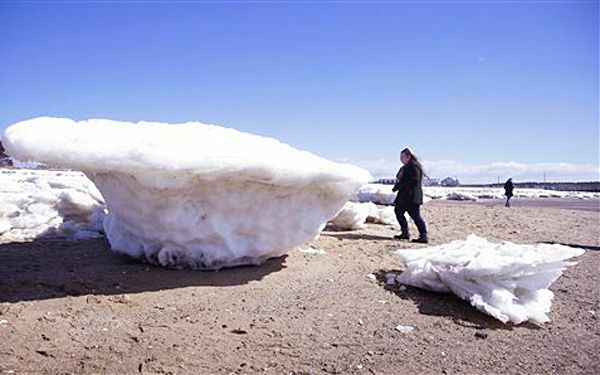 But massive chunks of ice have washed up on some beaches of Cape Cod. They're drawing curious onlookers. Children have been climbing some of the icy mammoths. The ice cropped up along DuckHarborBeach in Wellfleet. Despite a brief warmup earlier this week, there were still big chunks. Some were 5 1/2 to 6 feet high on the beach as late as Thursday. "It's amazing. They're like mini-icebergs," said Jessica Hornung, 33. She drove up from Connecticut with her three young children. They wanted to check out the unusual sight. "It would be awesome if there were a polar bear on one of them," she joked. Technically, the chunks aren't icebergs. Those are defined as large pieces that break off glaciers or polar ice shelves. Instead, meteorologists say they're fragments from the extraordinary amount of ice that built up in Massachusetts Bay. They were carried by currents into Cape Cod Bay and the Cape Cod Canal. It is a startling reminder of an epic winter. It has held much of New England in an icy grip for weeks. Michelle Norcross ventured out with her husband and daughter. She wanted to snap photographs of the huge chunks at low tide. That is when they're most visible. Some of the pieces are so big they dwarf humans. "I'm hoping they're right when they say this is a once-in-a-generation occurrence. It's beautiful, but it's very unusual," she said. "I don't want this to happen every year. It's kind of freaky." Officials say the ice chunks are melting and the phenomenon won't last long. Critical thinking challenge: Why are people calling the chucks icebergs if they aren't icebergs? People are calling these large chunks icebergs because meteorologists say that they're fragments from the ice that built up in the Massachusetts Bay. I think that this is a bad idea because if the huge chunks of ice are washing up on Massachusetts when Massachusetts are not familiar seeing icebergs of anything related to ice and they are washing up on shore then it is a bad news. Maybe it is because the ice are melting and they go underwater and the water brings them in to land. I think that the iceberg or chunk of ice is very cool because it is very big. Also in Massachusettes it doesn't get a lot of icebergs. But I think it is very amazing that that it is taller than a adult. Also I think it is bot okay for children to be climb on a huge iceberg because it would probably get destroyed. But why would a huge iceberg hit Massachuesettes.I think that the people should not climb it but take picture of it because soon or later the ice might melt and it would be gone forever. People are calling the icebergs icebergs because they look like icebergs. They look like icebergs because of how big they are. Another reason that look like icebergs are because they are ice. The other reason they call it a iceberg is because how it moved. Those are all the reasons that they look and are called icebergs. Why I think the people are calling them icebergs because they look like icebergs and they look like the same size as a real icebergs. Another way that the chucks of ice looks like icebergs is the icebergs come out from the sea. Another way that the chucks of ice would look like the icebergs is if you look at the ice you can see that it looks like a iceberge that a animal could sit on. The last way that the chuck of ice could look like a iceberge is if you look at the picture in looks like there are icebergs are in the sea. That is why I think that the chuck of ice looks like a iceberge. They are calling them icebergs because they look like an iceberg but they are actually fragments of ice built up in the Bay. 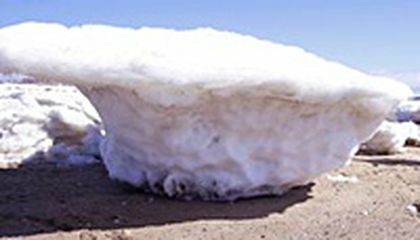 People are calling the ice chunks icebergs for a couple reasons. They think that the shape of the ice chunks looks like small icebergs. Another reason why people call them icebergs is because kids think that they are big enough to be an iceberg. But in the article, icebergs are large pieces that break off glaciers or polar ice shelves. The chunks don't meet this definition. Why are people calling the chucks icebergs if they aren't icebergs? I think that people are calling the chucks of icebergs if they aren't icebergs because they look like icebergs and is in the shape of an iceberg. I think that because to me it is flat at the top like when you see one in Antarctica, and also it comes into a point where it s like a cone shape at the bottom. I also think that it is the shape and looks like it because it looks cold to touch and Massachusetts is close to the beach and that is what I think how it got there. Finally, I think that it looks like actual icebergs because of the texture it looks like the texture of an iceberg. That is what I think of the Massachusetts icebergs. Because they are defined as large pieces that break off glaciers . 1 Because they the have chunks that come of the giant mammoths of ice. And because it says what they are in the article . And because they are like pieces that break off glaciers or polar ice shelves. People are calling chunks of ice icebergs. They are calling them icebergs because they look like icebergs. They are calling them icebergs also because there beautiful like them. People are also calling them icebergs because it come of of glaciers like icebergs. That is why they are calling it icebergs.